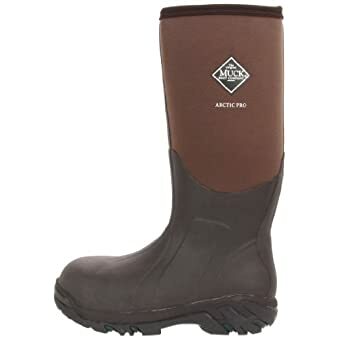 Muckboots Men's Arctic Pro Hunting Boot designed to keep your legs warm and dry even during extreme winter conditions up to -60o C. Muck boots are to set you free for hunting, leaving you worry-free of your legs. 8mm Neoprene helps in weather-resistance, warmth, and full comfort in walking. Shaft with cozy fitting keeps your boots comfortable to walk at any place in any condition with ease. These men's pro hunting boots are specially designed to have a firm grip on the ground even in wettest places. However, 17" height of the boot gives your legs proper protection without losing grip on legs. Arctic Pro, long-lasting and high-abrasion boots to use in extreme winter conditions do not seem to be failing to meet expectations of a user. The height of 17″ and a long stretch-fit shaft with fleece liner keep your legs warm even in the coolest area of the earth. Additional reinforcements at Achilles, instep, and heels give you snug fitting and comfort in cold conditions. These men’s pro-hunting boots are basically for warm in cold out condition. Hunters care less for their feet while they have Arctic Pro on because they have a peace of mind knowing that something trustworthy is already caring for their feet in rugged conditions for hunting. 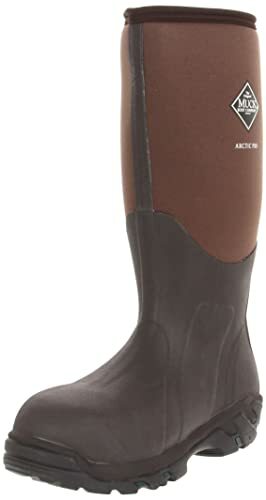 MuckBoots Men’s Arctic Pro Hunting Boots come in two different colors, bark and brown. Thoughtful design to keep legs of a user warm even in -60 degrees C make these men’s pro-hunting boots a better choice to go for. Fleece liner helps to keep cold out and encourages you to stay out for hunting or routine jobs in snow-covered areas even in the coldest of weathers. Hunting is a difficult activity because it may compel you to run in swampy and wet places and for such activities these men’s pro hunting boots seem to be useful than ever. Fleece liner works as an additional warmer for the boots. Temperature up to -60o C does not seem affecting legs of users and help concentrate on the job rather than on their feet while working. 8mm Neoprene does not only keep your legs warm but also keeps your boots weather-resistant or more waterproof. However, 2mm thermal foam bedded at the base renders additional warmth to your feet. In addition to the 8mm Neoprene, Arctic Pro boots have a stretch-fit top line, which gives snug-fit to the calves of users. Additional reinforcements at heels, Achilles, and in step render a comfortable cushioning for different parts of your legs. There is 2mm layer of thermal foam at the instep area, which does provide not only warmth but also a fine strike to instep area of the foot while walking or running. A wrap-up bumper is implemented to cover the toe area, which helps in absorbing shocks produced while running or walking. You don’t get sore toes because of that, thanks to the bumper. Reinforcement at the Achilles heel also renders comfortable cushioning to the Achilles part of the foot. Synthetic, fabric, and manmade sole make these men’s pro-hunting boots durable for many more seasons of winter to come. The high-abrasion rubber used for making outsole renders enough traction and make the outsole long wearing. Even in the swampy and slippery places, the outsole made of the high-abrasion rubber gives a firm grip on the ground. The structure of the boots allows cleaning them easily with just a spray of the water. The structure of these men’s pro-hunting boots is purposefully designed to be stable even on rugged surfaces, which help in smooth functioning of the boots during your job regardless of the condition. The adhesive friction of the outsole keeps boots normal even in slippery and wettest conditions. The Bob-Tracker outsole is durable on any surface according to the company. Almost a 1 kg boot, but because of its snug fitting, you don’t feel much of the weight of the boot. The flexibility of the boots matter, because no one would like to have stiff boots in extreme conditions, be it the coldest place, swampy or slippery place. And during hunting, you might want to run on bumpy surfaces where you would prefer flexible boots. Every step is comfortable with EVA midsole cushion. Breaths well: Airmesh lining allows air to circulate throughout the boots and helps in preventing humidity and stinky smells inside the boots. Even though the quality material is used to keep your feet warm, it does not make sweaty feet because of the linings provided. Ease of use: Feet inside MuckBoots Men's Arctic Pro Hunting Boots create a small comfort zone for you to wear it for a longer period regardless of the coldest or wettest weather conditions. Simple though stylish design gives the ease of use on any surface. Stylish: A fleece liner gives a woolen touch to the boots, 8mm Neoprene makes them weather-resistant and helps look a bit shiny outside. Although the design may not look so complicated or given priority by the manufacturer, the other functions, and quality of the materials used for the manufacturing of the boots make it stylish and preferable. 100% waterproof: Neoprene used to make these men's pro-hunting boots does not only make boots warm from inside but also waterproof from outside to keep boots functioning in coldest as well as wettest weather conditions. Stiff: Regardless of the pros of these men's pro-hunting boots, there are few negative reviews from some users. Some users have complained that they have found these boots a little stiff to the use. During work or hunting, it did not help them to have a sufficient flexibility. Wears out: Few users have complained that these boots wear out quickly with the extensive use. The rubber used as a bumper at the toe area is blamed for having a low-quality material and hence it allows water to penetrate through the boots after wearing out. From the overall review of the MuckBoots Men’s Arctic Pro Hunting Boots, it seems that Arctic Pro is worth a price. There are many more men’s pro-hunting boots available on the market, but these boots fulfill the requirements of male users. Men do not only use these boots for hunting but also for the jobs which involve long walking on ice for longer durations. Besides minor drawbacks of the Arctic Pro, these men’s pro-hunting boots meet the expectations of users. Boots are functional on any surface because of their logical structure. It’s always easy to order Arctic Pro from online stores. However, it’s recommended to visit the store to purchase desirable size of the boots.